Andrew Wright graduated from the University of California, Los Angeles and Loyola Law School. For over 20 years, Andrew represented clients who have been injured by an automobile accident, a dangerous condition on property, a work-related accident caused by a third party, or accidents caused by defective products or services. 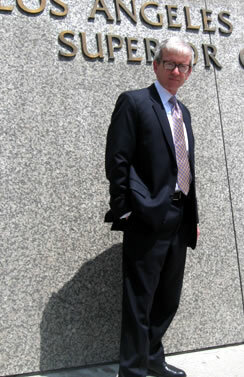 Andrew is an experienced trial lawyer. He litigates and tries cases from San Francisco to San Diego. Mr. Wright is a member of the Los Angeles chapter of the American Board of Trial Advocates, the nation's oldest and most respected association of lawyers comprised of attorneys who try civil lawsuits before juries. Andrew has been a member of the Consumer Attorneys Association of Los Angeles (formerly the Los Angeles Trial Lawyers Association) for over 20 years. The Consumer Attorneys Association of Los Angeles is the nation's largest organization of attorneys dedicated to protecting the rights of people who have been injured by unsafe products, services, pharmaceuticals, medical negligence, automobile accidents, work-related injury, and other forms of wrongful or negligent conduct. Andrew is on the Board of Governors of the Consumer Attorneys Association and sits on the Education Committee helping to create and present seminars designed to improve the courtroom skills of trial attorneys.